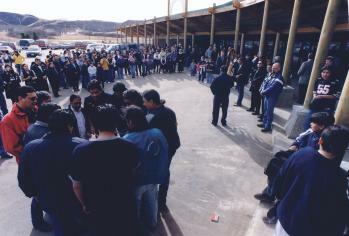 Grand opening of the newly renovated school on the Piapot First Nation Reserve, March 2000. Long before Saskatchewan was a province, the original peoples who lived on this land had a commitment to learning and Education. In the 19th century, this commitment was reflected in the signing of treaties that placed great importance on education and affirmed the value of learning. Over the years, Saskatchewan's education system has attempted to respond equitably to the needs of First Nations and Métis peoples. The history of Aboriginal education in Saskatchewan has been strongly influenced by a variety of provincial policies, practices and partnerships. In the 1980s, the Department of Education's Core Curriculum initiative endorsed the integration of First Nations and Métis content and perspectives as a foundation for provincial curriculum and resources for all students. Subsequently the 1989 framework, Indian and Métis Education Policy from Kindergarten to Grade 12, charted curriculum integration of First Nations and Métis content and perspectives across all required areas of study. In light of the rapidly growing Aboriginal population, the provincial government recognized the need for enhancements in the professional development of teachers, for specialized courses such as Native Studies and Indigenous languages, and for resources that reflect both the face and the voice of First Nations and Métis peoples. Joint initiatives between the province and First Nations and Métis peoples reflect their beliefs, values and worldviews as well as those of government departments responsible for education. For example, in 1984 the Minister's Advisory Committee on Native Curriculum Review was established, and renamed the Indian and Métis Education Advisory Committee (IMEAC) in 1989. IMEAC was established to advise and make recommendations to the Department on the development, implementation, monitoring, and review of the Kindergarten to Grade 12 policy and program in Indian and Métis education. In 2000, IMEAC became the Aboriginal Education Provincial Advisory Committee (AEPAC). Based upon recommendations and action plans put forth by AEPAC (and its predecessor advisory committees), Aboriginal education in the province has been shaped with a commitment to First Nations and Métis Children and youth. Saskatchewan is nationally renowned for transforming the nature of teaching and learning in Aboriginal education. This is demonstrated in the professional roles of First Nations and Métis peoples in school systems. In partnership, this province produces an increasing number of First Nations and Métis teachers and administrators through highly regarded teacher education programs that include the First Nations University of Canada (formerly known as Saskatchewan Indian Federated College), SUNTEP (Saskatchewan Urban Native Teacher Education Program), ITEP (Indian Teacher Education Program), and NORTEP (Northern Teacher Education Program). A critical lesson learned in this journey towards inclusive, responsive, and culturally affirming education indicates that our provincial motto, From many peoples, strength serves not only to inspire, but to indicate the need for partnerships in Aboriginal education. In 2003, Building Partnerships: First Nations and Métis Peoples and the Provincial Education System outlined a policy framework for Saskatchewan's pre-kindergarten to Grade 12 education system. Where provincial school divisions and band schools decide to combine their efforts through co-governance or co-management, such education partnerships are supported by Saskatchewan Learning. The formation of Elders' Councils to advise school administrations, and joint committees mandated to change curriculum to reflect local priorities and innovations, are examples of such partnering. The intent of the Building Partnership policy is to listen to First Nations and Métis peoples and share responsibility for decision-making in the field of education. Saskatchewan Learning. 2003. Building Partnerships: First Nations and Métis Peoples and the Provincial Education System. Regina: Saskatchewan Learning.